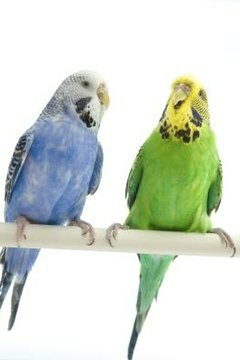 The budgie is a colorful and entertaining companion bird, popular because he's also inexpensive and low-maintenance. Temperamentally, the budgie's typically cheery and content, but he can get his beak out of joint in the company of another bird. Defending territory, jealousy, incompatibility and nesting are some causes of aggressive budgie behavior. Budgies are generally sociable birds who like to live in flocks, so it would seem logical that your pet budgie will welcome companions. This is not always the case. Although causes of aggression differ, and each one may produce specific behaviors, the ways a budgie displays aggression are generally the same. Signs of displeasure include raising his wings, biting, hissing, picking at his victim's feathers, chasing the other bird around the cage and preventing the bird from feeding or drinking water. You may have to separate birds that can't get on into different cages or even separate rooms. A budgie may act aggressively if he feels his territory is threatened. This may happen if you decide to get another budgie -- particularly if your original budgie has been on his own with you for some time. Behavioral signs of territorial aggression are guarding the food bowl and defending the perch inside the cage. The aggressive budgie may also defend spaces in the house when you allow your birds out for a fly around. Your budgie may have been quite happy to have your undivided attention. Having to share you with another budgie or a different species of companion bird in another cage, but in the same room, can produce signs of jealousy. Screaming and whistling sounds to get your attention is one sign. The budgie may become aggressive toward you as well as aggressive toward the newcomer. Some birds just don't get along. If the birds sit at opposite sides of the cage, don't interact by grooming each other and don't talk to each other, you have an incompatible pair. Diane Grindol, on BirdChannel.com, suggests putting the birds in separate cages and giving each budgie a mirror so they can socialize with a bird they do like -- themselves. If you have a large number of budgies, a breeding pair may display aggression when they are ready to mate. Typically, signs of this are creating and defending a nesting area in the cage. You can prevent breeding behavior by limiting a budgie's exposure to daylight to between 10 and 12 hours.